118758_01 Tim and crash stickers. WYNDHAM drivers will have a better idea about what to do if they are involved in a car crash thanks to the Wyndham Humanitarian Network’s Had a Crash campaign. The Tarneit MP Tim Pallas launched the campaign at Wayaperri House recently. “This campaign highlights the importance of knowing what to do in the event of an accident, but will also serve as an important reminder for people to drive safely – particularly over the Easter long weekend,” Mr Pallas said. “Having a crash is stressful and it can be difficult to know exactly what to do,” Jennie Barrera, chairwoman of the Wyndham Humanitarian Network, said. Wyndham Legal Service lawyer Simone King said the campaign would help people be better informed. “Unfortunately, many people don’t know what information to exchange and what to do when they are involved in an accident – we see this all too often at the Wyndham Legal Service’s Motor Vehicle Accident Clinic,” Ms King said. Victoria Police Leading Senior Constable and multicultural liaison officer Richard Dove said motor vehicle accidents was an area of the law that drivers from newly arrived communities could easily find themselves in trouble with police through not knowing the correct procedure. “This can be quite devastating when a newly arrived migrant discovers that they have not only had a crash, but are now subject to charges which could see them heavily fined or facing a magistrate,” he said. 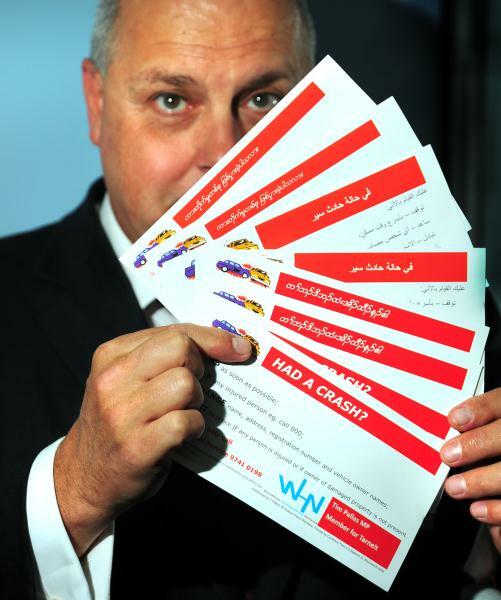 The free stickers are available in English, Karen, Burmese and Arabic and can be collected from Wyndham Legal Service. The Wyndham Legal Service Motor Vehicle Accident Clinic is held every Monday from 10am to noon at the WLS Office 10/2-14 Station Pl, Werribee.